“God stood before me on Tuesday. It rained that day.” One of those claims is verifiable and one is not. What methods and evidence would you use to test each? What if that was today? Do you suppose that direct experience with both rain and God would be impossible to question? Experiencing rain is a discernable, sensory event, defined by an identifiable material (water) which falls from the sky, under the effect of gravity. Its evidence is such that a child could explain how they know it rained recently. Could there be an illusion or false copy of “rain”? Maybe, but there’s little harm in accepting a perfect replication of falling water as being “rain” if it seems to BE rain in every imaginable way. However, accepting that “God” is standing before you clearly has very different consequences. If a God-like being were on Earth performing wondrous miracles, unleashing deadly wrath, telling the future and much more, couldn’t he also easily mislead us at will? Of course he could! A being of such knowledge and power could give anyone exactly the experience they expected from God, no matter his true identity. Ultimately, we could only ever take him at his word and hope he isn’t just an impostor. Why? Human minds would be laughably inadequate to reveal an all powerful being’s true nature and intentions. 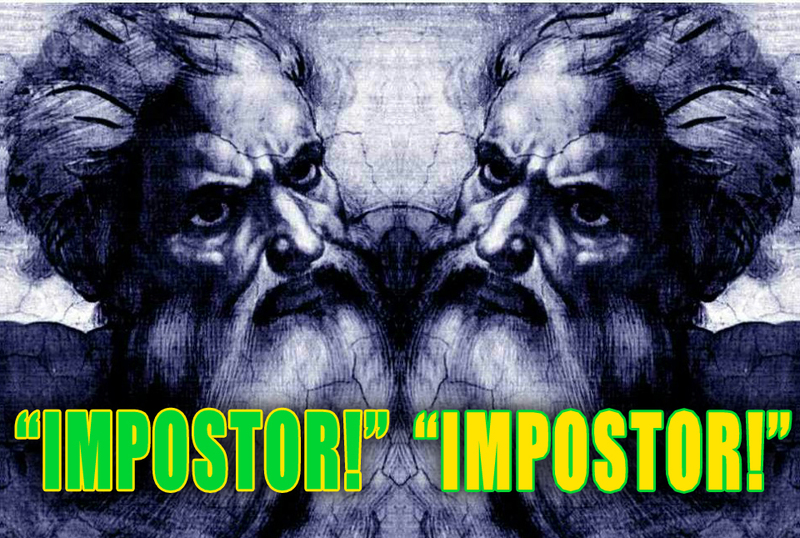 If you can’t imagine witnessing your God’s power, as performed by an impostor, then you haven’t much of an imagination. Believers already label natural events and mysteries as being from God, WITHOUT directly experiencing the supposed cause. Talk about leaving the door open to be misled! God could be a naturally occurring magical being who easily reads our mind, knows the future, raises the dead, makes us feel his presence and of course can look like a human with a perfectly groomed beard. Pure fiction you say? No, it’s not a stretch considering that believers already suppose exactly the same thing, only replacing natural with supernatural. Any thoughts? Perhaps you’re thinking how “THAT discovery would simply be the revealed nature of God, so his rules still apply and he is still God. It’s exactly like your imperceptible copy of “rain” effectively still being just rain to us”. Is it? If those many fake instances of rain were indistinguishable from real rain there’s no apparent consequence, even if it were somehow a deception. Alternately, what if there were two indistinguishable Gods now claiming to be the one real God? Suddenly, it becomes obvious and important that one of them (at least) is a fake and/or a deceiver. Even if they seemed to have identical powers and competed to the death to claim the title, wouldn’t you want the real God of the Bible to win? Wouldn’t you insist on knowing if the victor was actually the deceiver or not, especially before you kneeled, loved and worshiped him? Obviously you wouldn’t be okay with worshiping the equivalent of the Devil, even if he filled the roll of God as far as you could tell, right? Did your common sense kick in just now when you realized that there are DRAMATIC consequences to blindly accepting whoever may be in charge? If it is a deceiver, then your abandoning of reason was utterly short sighted. If you’re lucky he won’t punish people for such irresponsible blind faith, but instead reward them like the last guy did. Don’t stress though, even witnessing “miracles” from the source, all day long, doesn’t demonstrate its divinity, its honesty or the being’s true nature. The reality is that there is no apparent God running around for humans to even consider as a candidate and the best divine evidence amounts to natural events, mysteries, and anecdotes. Simply labeling these things with a divine cause is just as silly as claiming that faerie magic did it. It’s not evidence & it certainly doesn’t confirm a God. 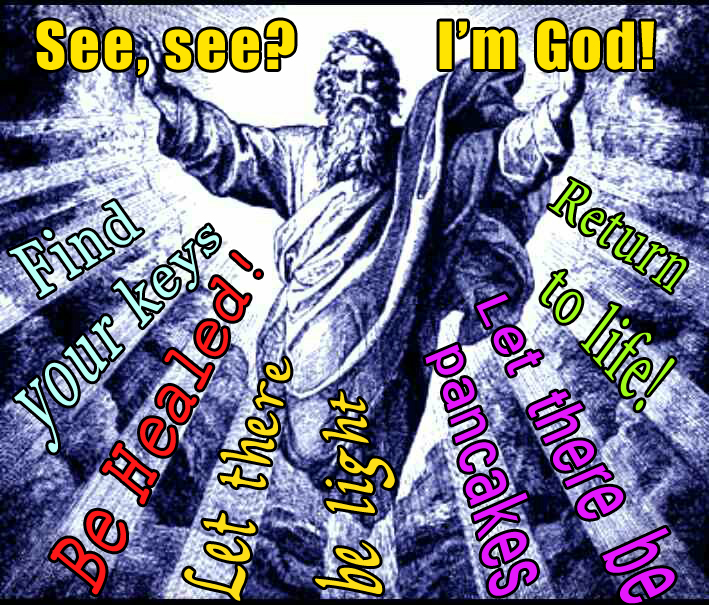 At least that potential impostor god performing miracles would be SOMETHING god-like to worship, while today’s believers have nothing to even point to. This empty bank of evidence supporting a dangerous culture of faith, makes buying into religion utterly absurd, irresponsible & arguably harmful for anyone to believe, let alone to pass on to others. Think about it. Even the best imaginable evidence wouldn’t verify divinity, but instead just a higher power. Having no such evidence, we can only suppose and blindly guess if such a power even exists. Assuming you believe anyway, despite such bad evidence, what do you truly know about your imagined God-like being? The honest answer is “Nothing”. The intelligent response is atheism.